At the end of yesterday's Fox & Friends Sunday morning with Fr. Jonathan segment, Morris, who was in Jerusalem with Archbishop Dolan, jokingly asked if the "friends" could broadcast from Jerusalem. Alysin Camerota joked "why don't we." Dave Briggs, pointing upward, said "call the big guy and I don't mean God, you know the big guy, our version of God." Camerota laughingly interjected, "you've got connections both, so whoever you want to call." A good laugh was had by all. So let's see. Who is, literally and figuratively, "big" at Fox News? Could it be Roger Ailes? And if so, it's a nice quid pro quo. Ailes gets to use a conservative Catholic priest to validate right wing dogma and thus bring some Catholic sheaves into the Republican fold. He also gets to boost Fox ratings as Morris always promotes his Fox appearances on his Facebook page. Morris gets a paycheck and an opportunity to remind Catholics of the tenets of their faith. He also gets to advise them about voting for the candidate who shares their values and who will make nice with the conservative bishops (hint, it's not Obama) whose religious liberty, according to Fox News and Fr. Morris, is being compromised. Sweet "connection." Can we say "friends with benefits?" Fox & Friends' "version of God?" Correction: Old St. Patrick's Cathedral is not in the NYC Theater Disrict as I originally reported. Comment has been amended. 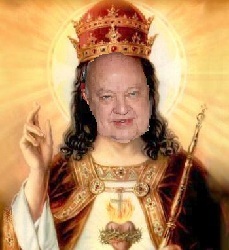 Jabba T. Ailes hearts the little propaganda padre. And vice versa. Neither the new or the old St. Patrick’s is in the NYC theatre district – the new one is on 5th Ave and the old one is Downtown on Mulberry St.
Blasphemous Idiots Corrupted by money. Morris, the Rasputin of Faux. Well, it’s nice to know that Fr Morris has no problem with blasphemy. Of course, we all know that FoxNoise has no problem with blasphemy (unless it emanates from “liberals”), but a priest? Even in jest, the good Father should’ve done his pastoral duty and chastised Briggs and Camerota.